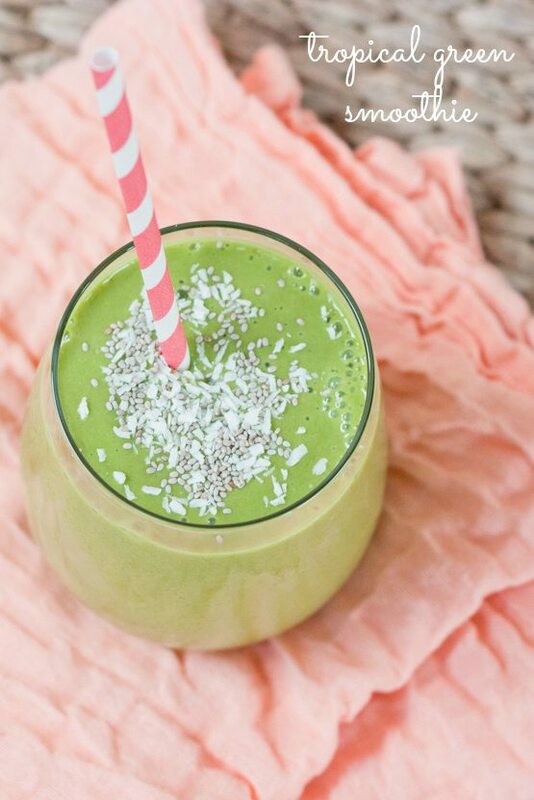 A creamy tropical green smoothie with banana, mango, coconut, spinach, protein powder and chia seeds. 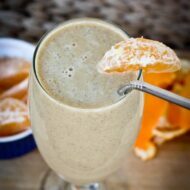 The perfect healthy smoothie for summer! The weather is starting to heat up here in Virginia. It’s officially time to start packing away my winter wardrobe, busting out the shorts and incorporating more warm weather foods, like overnight oats and smoothies, into my diet. I’m pretty sure you guys already know this, but I’m pretty much hooked on adding greens to all of my smoothies. 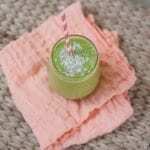 If you haven’t tried my green lemonade smoothie, what are you waiting for? Just kidding, kind of. No, but really, it’s good and I do recommend trying it. 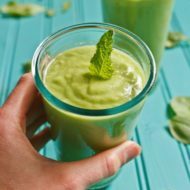 I’ve grown to like the “green” taste in my smoothies but the recipe I’m sharing today is perfect for those just getting hopping on-board the green smoothie train. It uses frozen banana and mango, both of which are super sweet and do a great job masking just about anything. 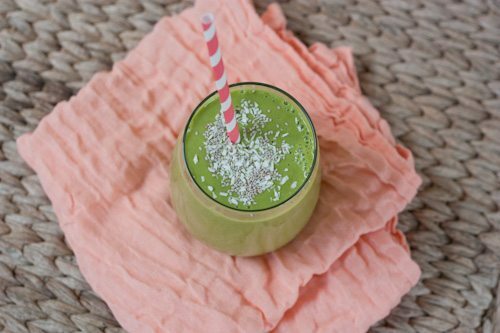 Of course, it’s still a winner for those of us that have been drinking green smoothies for ages — you can’t really go wrong when combining banana, mango and coconut. 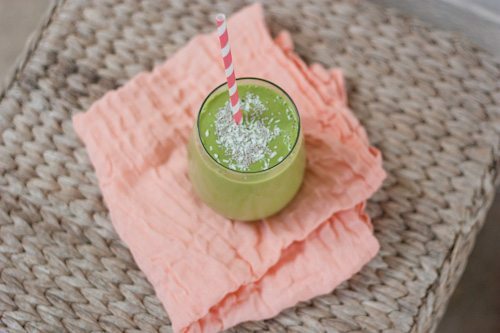 Place all ingredients except the shredded coconut into a high-powered blender and blend until smooth. Sprinkle a few extra chia seeds and the unsweetened coconut on top. Enjoy! I normally buy and use Unsweetened Vanilla Almond Breeze but this week I decided to switch it up and buy the Unsweetened Almondmilk Coconutmilk blend. 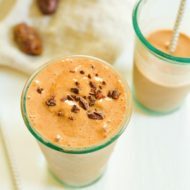 It’s perfect for this tropical smoothie but I also love the subtle coconut flavor it adds to my morning iced coffee. I’ve been enjoying it this week while day dreaming about laying on the beach with my toes in the sand. Can you tell I’m ready for our honeymoon? What’s your favorite green smoothie combo? I’m a huge fan of smoothies! I love all kinds, but I think green smoothies are my fav! They’re so tasty and so healthy for you. I can’t wait to give this one a try! It’s perfect for the season! Looks tropical and amazing! My green smoothies have been uber green lately…1 green apple, 1/2 avocado, 1/2 orange, ginger, kale, spinach, parsley (makes about 3 servings). So refreshing! I love any type of green smoothie…seriously!! My fave combo for a while was strawberry, banana, peach!! I have been loving coconut lately!! That sounds so delicious! This looks delicious and refreshing! Such a cute straw… where did you find it? I LOVE putting mango in my smoothies. And I’ve been adding greens to them for so long that now if I don’t have any, I won’t even make one. Ha 🙂 and I’ve been wanting to try that coconut almond milk but wasnt sure, I will have to pick some up this weekend. I have been so into making smoothies for breakfast lately! 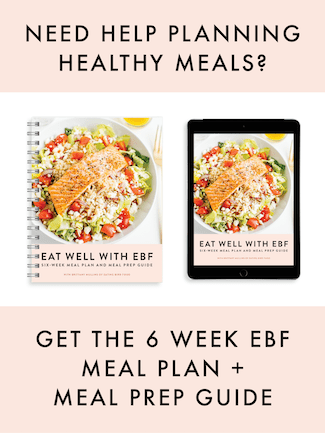 – I was so excited to see this post! I’m a new reader, love your blog! 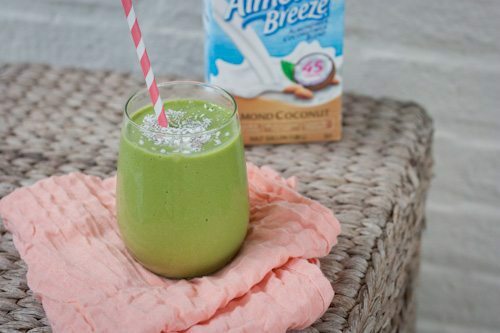 One of my favorite smoothie combo is similar except I forgo the protein powder and add 2 tablespoons hemp seeds and add frozen pineapple for more zing! I am just starting to add either a green juice or green smoothie to my breakfast every morning. I am sure this one will be a hit, I love bananas and mangoes. I make a slightly different version: Frozen banana, frozen Mango, frozen pineapple, spinach and coconut water. Coconut Water is a lot better for you then coconut milk and has less calories. A lot of people say coconut water hydrates you more then water. I love smoothies!!! Actually, when pregnant I had to drink a small one before each small meal, it was the absolute only way to keep food down and get enough nutrients for the baby! I do have one question with this one, would it still be good without the brown rice powder? I need to avoid that. Besides that one small ingredient, this looks so good!! !